The results of the Hot and Cold Weather Poll are in and the data is fascinating. Here’s how hot and how cold truck campers will go camping. Can we take the heat? How cold can we bear? Looking at the graphs, two things jumped out at us immediately. First, over 35-percent of us don’t care how cold it gets – they’re going camping. Second, over 33-percent of us don’t care how hot it gets – they’re going camping. The question is, are the approximately one-third who don’t care about how cold it gets the same one-third who don’t care how hot it gets? 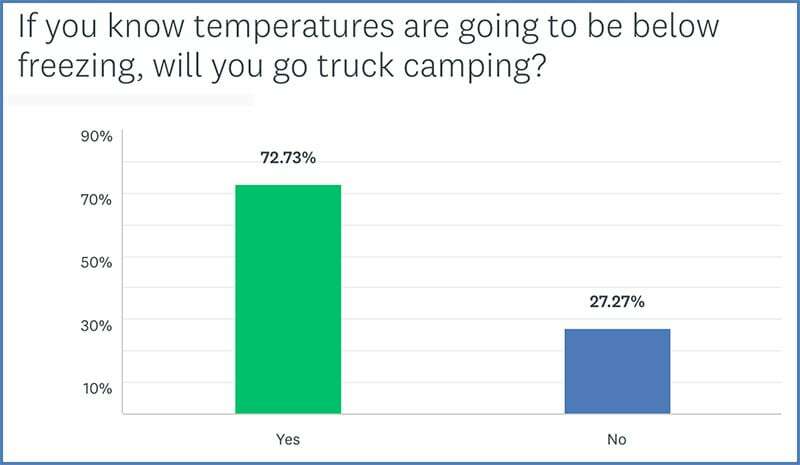 The survey wasn’t designed to correlate that data, but we suspect about 33-percent of us would go truck camping no matter what the temperature it is. That’s what propane furnaces, generators, and air conditioners are for – right? Taking another look at the coldest temperature graph, there are some interesting points. About 19-percent of us prefer camping in temperatures 40-degrees Fahrenheit (4-degrees Celsius) and above. That leaves the other 81-percent who will camp in what most of us would consider cold; temperatures under 39-degrees Fahrenheit (3-degrees Celsius). What’s most impressive is how many of us would go truck camping in temps below freezing. 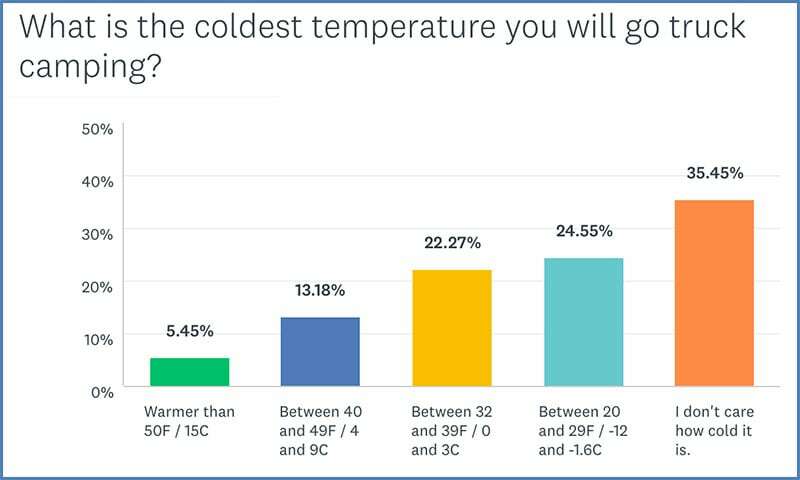 From our survey, over 72-percent of us are ready to camp 32F / 0C. Polar bears are us. Turning to the hottest temperature results is a different story. About 9-percent of us won’t camp in temperatures higher than 79F/26-C. That seems mighty comfortable to us, but some folks evidently hate the heat. Another third of us will camp in temperatures up to 89F/31C. That’s us as well. Beyond about 85F, we want air conditioning. When we asked if folks would camp in temps above 100F / 38C, the results indicate a trend. Almost 53-percent said no. 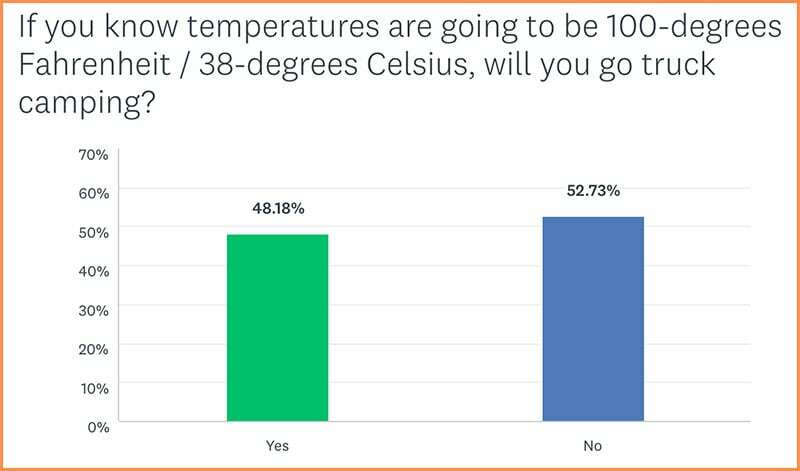 From this data, it’s fair to conclude that our community is much more willing to go truck camping in below freezing temperatures than temperatures pushing 100-degrees Fahrenheit / 38-degrees Celsius. In general, truck campers don’t mind cold, but we’re not into hot. 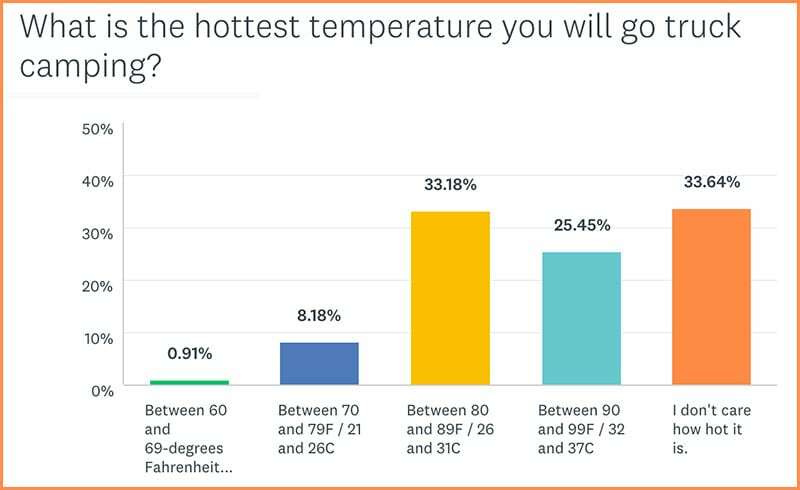 For a follow-up Question of the Week it would be interesting to ask whether the same group that avoids the heat tends to stay home during the peak summer months. The hottest temperatures also correspond to the peak traffic times for most state and national parks, and other attractions. For these reasons, it makes sense to go truck camping during the spring and fall shoulder seasons. If you camp in extreme weather, readers have shared ideas on how to stay cool in the heat and how to stay warm in the cold.